Martin Parnell talks about how to “Overcome Obstacles to Achieve your Full Potential.” He reveals how we can all set goals and achieve results we never thought possible. Parnell is an international keynote speaker, author and multi-Guinness World Record holder. In 2010, following a 25-year mining career, Martin started his “Quests for Kids” initiative. Over the next five years he completed 10 “Quests.” They included running 250 marathons in one year, setting five Guinness World Records and ascending Mount Kilimanjaro in 21 hours. At the end of 2014 over $1.3m had been raised for the humanitarian organization Right To Play which gave 27,000 children the gift of hope. Martin Parnell is a member of the Rotary Club of Cochrane and was awarded the Queen Elizabeth II Diamond Jubilee Medal in October 2012. In January, 2013 he was named as one of the Calgary Heralds “20 Compelling Calgarians.” Martin has delivered numerous keynote presentations across Canada. Clients include: IdeaCity11, Sun Life Financial, Canadian Wealth Management, Avanti Software, Human Resources Institute of Alberta, Alberta Association of Recreation Facilities Personnel, Centron Construction and over 100 schools. Martin addresses what it takes for one ordinary individual to become a leader and motivate and inspire others. To achieve his goals, Martin has drawn on a variety of skills and characteristics, which include having a strong commitment, determination and the resilience to overcome a wide range of obstacles, along the way. He also acknowledges the importance of having a good support team and shows how choosing the right individuals to help you succeed. As someone who went from a career in the mining industry to becoming an elite Athlete Ambassador for one of the world’s best-known humanitarian organizations, Martin will take you on a journey that will both amaze and inspire. Telling a story which will amaze and inspire, Martin will show how, through determination and persistence, one person can affect change, one step at a time, to achieve a remarkable goal. He will explain how he tackled many obstacles, including injury, skepticism and ever-changing degrees of temperature to achieve his dream. Learn how he had to adapt his diet in order to stay healthy and undergo constant monitoring by a team of health professionals. Martin talks about the challenges of fundraising, having no corporate sponsors and learning to deal with global media attention. Above all, Martin motivates audience members to remain positive and focused on their goals. He transposes the examples of running, endurance, resilience and obstacles to make them applicable to our Canadian work and life experience. In 2005, during a four-month cycling trip through Africa, Martin Parnell was struck by the transformative and positive power of sport to change lives. Five years later the 55-year-old dedicated a year of his life to run 250 marathons with the aim of raising $250,000 for the charity Right To Play, an international humanitarian organization that reaches out to disadvantaged children around the world. Along with information on technique, gear, nutrition and the challenges facing new and seasoned athletes as they prepare for either regular or ultramarathons, Martin gives honest and often humorous insight into why an ordinary person would attempt to do something extraordinary in pursuit of their goal to make the world a better place. In 2010, at age 55, Martin Parnell began tackling a series of extreme sporting challenges which became known as "Quests for Kids", designed to help improve the lives of 20,000 children through sport and play programs raising $1 million for the children's charity Right To Play. Despite his high level of fitness, in early 2015, Parnell was confronted with the devastating news that doctors had found a large and rare blood clot on his brain. He was immediately hospitalized and had to face the reality of close to one year of limited physical activity. His plans for a professional speaking career and further athletic endeavours were put on hold. Martin's second book highlights many of his most recent and remarkable sporting and philanthropic achievements, while also giving personal insight into what it means to slow down and focus on moving forward in the face of one's own physical limitations. Martin Parnell's third book takes the reader on an inspirational journey into a country known for political chaos and female oppression. “The children were stoning us, the people said bad words like 'prostitutes, why don't you stay at home? You are destroying Islam.'" - Zainab, Afghanistan's first female marathon runner. In 2016, Martin Parnell went on a journey that many believed was madness: running a marathon in Afghanistan in a quest to fight for women's rights and gender equality. Of course, this was not the first time he had been called crazy. In 2010 he had run 250 marathons in one year and in 2013 he had climbed Mount Kilimanjaro in 21 hours. These two endeavours were part of his “Quest for Kids” initiative in which he raised $1.3-million for the humanitarian organization Right To Play and had given the gift of hope to over 27,000 children around the world. It was while recovering from a life-threatening and rare blood clot on his brain that Martin had read about Zainab, the first woman to run a marathon in Afghanistan. He was so inspired by her story that he decided that if he was able to recover from his illness he would run with her at the next "Marathon of Afghanistan" in support of rights for girls and women. 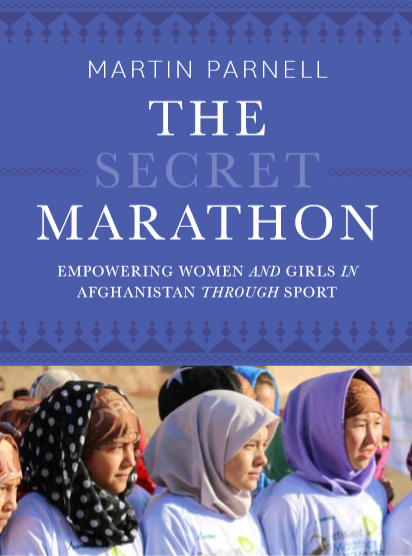 In The Secret Marathon, readers will be transported to a country of beauty, hardship and complexity, sharing in the despair, resilience and friendliness of the Afghan people as they strive for freedom and equality for themselves and their fellow citizens." Braving the cold for a cause in Cochrane, Alta. Martin was the keynote speaker at our annual corporate gathering and presented his amazing story to our group. We had a very diverse group of people, with all of Centron’s office staff and site staff as well as spouses. This included everybody from the President and CEO to the site workers. Martin did a great job of connecting with the audience with a very interesting, humorous and overall, very inspiring presentation. We had a lot of feedback after the event from our staff remarking on how Martin’s presentation had struck a chord with them and how remarkable his achievements are. As Martin says, he is an ordinary person trying to do his part to help others who are less fortunate. He certainly is doing extraordinary things and through his example is encouraging a lot of others in a lot of ways, in addition to the children who are getting life changing help from the RTP programs. We highly recommend Martin as a very interesting and inspirational speaker and fully support his Right to Play fundraising quests. Martin is truly an inspiration and I would easily recommend anyone to engage him as a keynote or guest speaker for their event. We wanted to host an appreciation event for our clients. As we brainstormed about themes, we kept coming back to wellness (health, fitness, wealth, family, philanthropy, balance...). Naturally, Martin's name came up. We were honoured to partner with Martin in his fundraising efforts and to support his Marathon Quest 250 objective to raise funds for Right to Play. Martin was a fantastic speaker, proving that anything is possible if we put our heart and soul into it. His words and energetic spirit moved all in attendance to do what they can to make a difference. Thank you, Martin, for making a difference in the lives of children around the world!!! Martin Parnell presented the keynote address at our 2013 Annual Conference. Martin is an excellent story teller with a great story to tell! His presentation was fun, engaging and inspiring. Many of our conference delegates remarked on Martin’s great presentation and have asked for more information about Martin and Right To Play. Martin took the time to meet with our delegates before and after his presentation and was a positive force during our conference. Make sure you get a chance to hear Martin’s story!